Yesterday I posted about the unusual living arrangements Sean and I have chosen for our family. I stated I recognized it’s not normal, but that it works for us. What I received in return for publishing this post was a reminder from my readers to focus on what best works for us–however non-traditional it might be–instead of comparing us to what society sees as normal. What’s “normal” can be an ill-fitting solution and actually cause more harm, which I believe would happen to us if we had not made the choice we did regarding our family’s living arrangement. I learned this lesson during my divorce, but somehow I had forgotten it. Several years ago I was told by many–including divorce lawyers I hired and fired–that it wasn’t normal to handle my divorce the way I did. The amicable relationship with my ex isn’t seen as normal either. I am sure the same naysayers would think it wasn’t normal I have become friends with Sean’s ex either. What I have been reminded this week, thanks to my wonderful readers, is instead of comparing my decisions to what is normal, I should simply focus on what is normal and right for us. I have no fear of stepping outside what is the norm, but it’s good to be reminded I am not alone in choosing a different path. 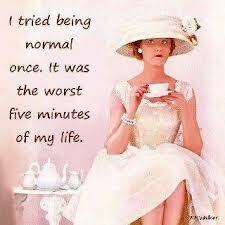 I know people who fight tooth & nail to hold on to that concept of what is considered “normal”. They usually just end up frustrating themselves & those around them. I gave up on the idea a long time ago. Too stressful & boring. Vinny C recently posted..No! And I Mean It… Okay? Choosing to do what works for you, regardless of whether it’s deemed normal or not, always works out best in the end. That’s what I am hoping for this time, too. This is true, TB. Thanks for the encouraging words. This arrangement we have made for our family works for us and we are also excited about it. Perfectly said! The reason I end every post with “That’s just my normal” is to remind myself and others that it IS mine. Doesn’t have to be everyone’s. It’s ok that it’s just mine and not yours or hers or his. We are all just trying to find some normalcy in this ever-redefining life we lead. For some of us, “normal” is comforting because it is reliable and consistent. For others “normal” is a negative word. If your family’s normal helps you all live and love and laugh together… than go for it! Thank you for the reassuring words, Vicky! We are establishing a life and a family in an unusual way, but it works for us and feels right. We are letting that and our love for each other and the kids guide us.